MILWAUKEE, Feb. 20, 2019 /PRNewswire/ -- The ManpowerGroup (NYSE: MAN) Solutions Total Workforce Index™ 2019 reveals Ireland, Norway and the UK as top labor markets across the globe for sourcing, hiring and retaining workforce skills. In an increasingly complex global market, access to skilled talent is a priority for organizations looking to build or grow their business. The Total Workforce Index™ is the only tool of its kind to use Big Data combined with expert insight to compare workforce potential across markets by evaluating the skills availability, cost efficiency and workforce productivity of both permanent and contingent labor sources. The Index uses a proprietary formula that can be customized to respond specifically to an organization's most pressing workforce priorities. These can range from sector specific skills challenges and the impact of shifting regulations to flexible scheduling and changing wages by location across sectors from oil and gas to IT and manufacturing. "The emergence of new skills and new talent pools, together with fresh ways to work and get work done, mean companies have more options than ever when identifying where to locate or expand their operations," said Becky Frankiewicz, President of ManpowerGroup North America. "Whether the priority is a specific tech skilled workforce or setting up a new call center, we can use the index to provide companies with data that helps them to make better and faster strategic decisions. With this right combination of data and insights, organizations can execute a precise talent strategy to meet their unique business needs." View the full Total Workforce Index™ 2018 report at https://www.manpowergroupsolutions.com/twi for the full rankings on markets most favorable to conduct business. APAC - Hong Kong, New Zealand, Singapore are the top markets for business development in the APAC region and globally. Hong Kong and Singapore rank highly for larger talent pools and support of flexible working conditions versus markets with new tax policies and labor laws. AMERICAS - The United States and Canada claim the top two rankings in the Americas region due to their mature workforces, followed by Chile, Mexico and Puerto Rico. Across South and Central America, micro market shifts and significant legislative changes can increase hiring complexity. The lowest ranked countries across the TWI globally are also in the Americas: Brazil, Honduras, Bolivia and Venezuela. Only the U.S. and Canada rank in the global top 10 - at 4th and 6th respectively. EMEA - The top five ranked countries in the region are the UK, Ireland, Estonia, United Arab Emirates and Israel. All of these countries bar Israel rank in the top 10 globally. Increasing access to education and investment in skills development have contributed to the workforce potential across the region. The Total Workforce Index™ (TWI) uses a proprietary formula to measure the relative ease of sourcing, hiring and retaining a workforce in competing labor markets around the world. The TWI compiles more than 90 key factors which relate to the Availability, Cost Efficiency, Regulation and Productivity of the workforce of each country. Unlike any other Workforce Index, the Total Workforce Index™ considers the entire workforce and not a single segment of the workforce in each country. The inclusion of the complete workforce allows for segmentation to review and analyze the contingent and permanent workforce considerations, in addition to the sum of these two workforce segments. 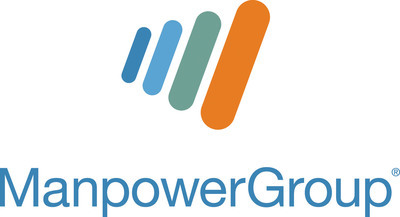 ManpowerGroup Solutions provides clients with outsourcing services related to human resources functions, primarily in the areas of large-scale recruiting and workforce-intensive initiatives that are outcome-based, thereby sharing in the risk and reward with our clients. Our solutions offerings include TAPFIN-Managed Service Provider, Strategic Workforce Consulting, Borderless Talent Solutions, Talent Based Outsourcing and Recruitment Process Outsourcing, where we are one of the largest providers of permanent and contingent recruitment in the world. ManpowerGroup Solutions is part of the ManpowerGroup family of companies, which also includes Manpower, Experis, and Right Management. More information at www.manpowergroupsolutions.com.